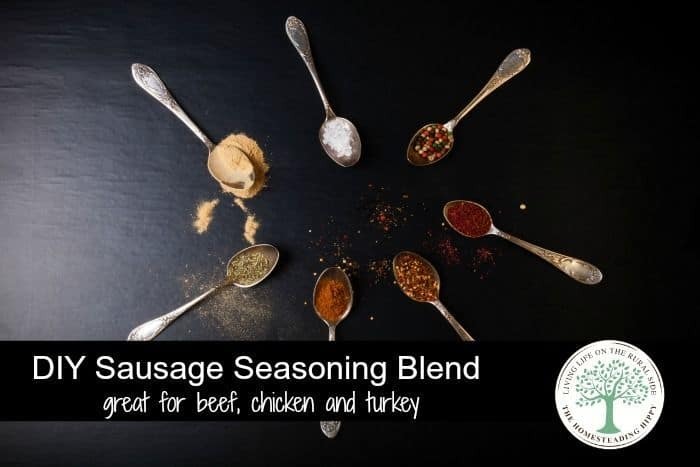 Homemade sausage seasoning can turn virtually any meat into a sausage-like flavorful meal! Get the ingredients and recipe here! Biscuits and gravy. Pizza. Tossed in with spaghetti. Is there a better way to enjoy sausage? The problem for us is that most sausage is pork based. We don’t eat the regular sausage from pork for a lot of reasons. I am not a fan of how commercial pigs are raised for meat, nor am I of the belief that their meat is good for you at all. We also abstain from pork for religious reasons, according to Levitical food laws. Of course, there are exceptions to every rule, and different beliefs for each person. Go with what you feel is best for your family, of course. This is just *my* personal opinion and what we believe. Learning to live without one of our favorite foods wasn’t easy. We LOVED sausage pizza on the weekends, and a hearty breakfast of biscuits with sausage gravy made winter mornings far more bearable. My family loved the taste of pork sausage like nobody’s business, and when I took this out of our diets, a revolt started. I had to make a change in how I seasoned the meat we could eat. I found that by mixing different seasonings with hamburger, turkey, or even chicken, I could achieve a sausage-like flavor without the pork. We like to use this on pizza, with eggs in the morning, and we have even tried stuffing our own sheep casings to make our own sausage. Mix ingredients in order in a jar. Add an airtight lid and shake it up. Let sit for at least 30 minutes before use to allow the spices to settle together. To use, add 1/4 cup to each pound of meat. For sausage like patties, mix the meat with the seasonings and then shape and fry. To use as ground sausage for pizza toppings, spaghetti, biscuits, and gravy, etc. then you will add the seasonings as the meat is finishing browning, with up to 1 /3 cup water to blend into the meat. 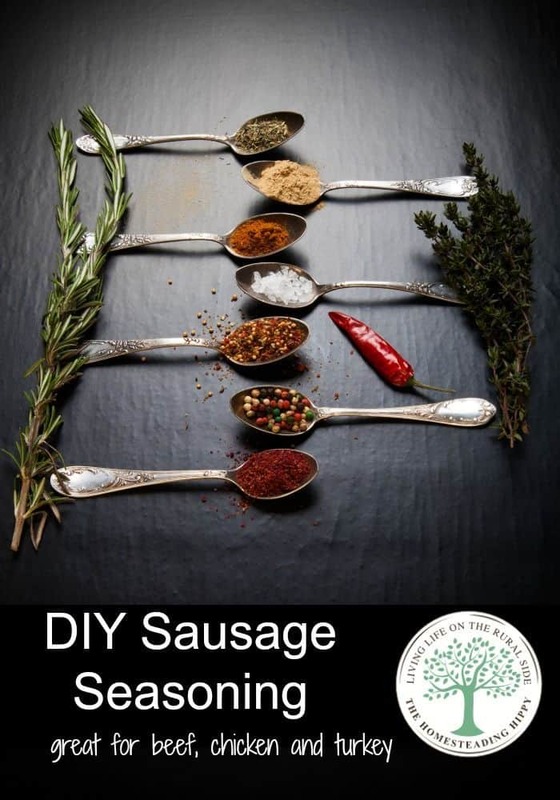 This is great for a homemade breakfast sausage seasoning, too! HA! So crazy that you posted this today!! I was just heading to the kitchen to work on a sausage recipe to use up all that ground pork in my freezer. Love it. What a great photo of the sausage patties! I’m pinning this to try. I already have used a recipe to make my ground turkey more sausage-like, but I will have to try this one too. I also avoid pork, but mine is because sometimes it upsets my husband’s stomach. I am really excited to try this recipe! I love the flavors of sausage, but it would be good in ground beef or chicken as well. Thanks for the recipe, however, do you really believe the other animals you eat are being raised any differently? If you don’t grow it yourself, then you truly don’t know where it’s coming from. thanks for your comment…if you read my blog at all, you’ll discover that we DO raise our own animals for food. is the rosemary ground up or whole? I bet it would! Let me know how you like it! I can’t wait to try this, my family loves the turkey breakfast sausage. But I much prefer making it myself. Although I haven’t found the right flavoring yet. We do not eat pork either, for religious reasons. When I married my spouse my mother thought I was joining a cult, LOL! But the benefits are great! Very excited to try this. I am starting to make more things from scratch. Would love to hear how it works with venison!!! Sounds yummy. Why only 3 months ? Will omitting brown sugar until using extend shelf life? to be honest, I’ve only had it last 3 months in my home. Most spices start to lose their deep flavor after that time as well.